Richebourg is one of the six fabled Grands Crus of Vosne Romanée; its wines often representing the apogee of red Burgundy. Lying between Flagey-Échezeaux (home of the Échezeaux appellation) and Nuits-Saint-Georges, Vosne-Romanée occupies the middle position in the Côte de Nuits. A thousand years ago, it was the Benedictine monks of Saint-Vivant de Vergy and the Cistercians of Cîteaux who first realised the value of these very special plots of land. It borders La Romanée and Romanée-Conti in the south and Romanée-Saint-Vivant in the east. The climat is 7.40 hectares and is planted with Pinot Noir grapes, making only red wine. It is known for its rich, opulent style and round tannins. These wines age impressively well but they have a dense, fruity, very aromatic taste that makes them hard to resist when young. 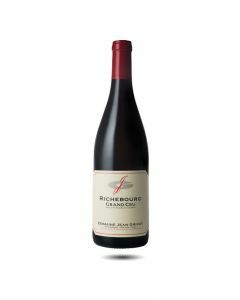 The estate's Le Richbourg is produced from a parcel of vines bought by Etienne's father, Jean Grivot, in 1984. The love and attention lavished upon these old vines (over 60 years old) ever since has paid dividends in recent years: the wines are rich, complete, persistent on the palate with a very long ageing potential that will reward patient winelovers. This Le Richbourg is immensely powerful, very rich and tannic which acquires, with age, a silky-smooth texture, sophistication and perfume unique to Vosne-Romanée Grand Crus. The 2013 wines are showing well at the moment and this Richebourg is very impressive for its purity and precision. It has attractive red and black berry fruit aromas in the nose which mix with lovely floral notes of violet and peony, an attractive freshness immediately on the attack and good balance between the richness of the fruit and the acidity. Further on, the wine becomes more serious and structured and finishes with impressive tension and intensity. A great wine which shows well now but due to its tightly packed tannins will probably close down to emerge as a gorgeous mature wine in 20 years or so. This wine is considered by many to be one of the top Burgundies of the vintage; unfortunately we have only a small amount available. Like the Echezeaux, the first thing you notice about this wine is the aromatic intensity of the nose with great spice but also a lovely floral character of peonies and roses. The wine becomes sterner and more masculine on the palate with power and richness, offset by beautifully nuanced tannins and delicious, ripe, currant fruit. The finish is very long and precise. This wine will last at least 20 years and should find a place in every Burgundy fan’s cellar. Floral and open in the nose with notes of wild flowers and hedgerow autumn fruits (sloes, rosehips and blackberries). Intense, powerful and structured with a great finish.